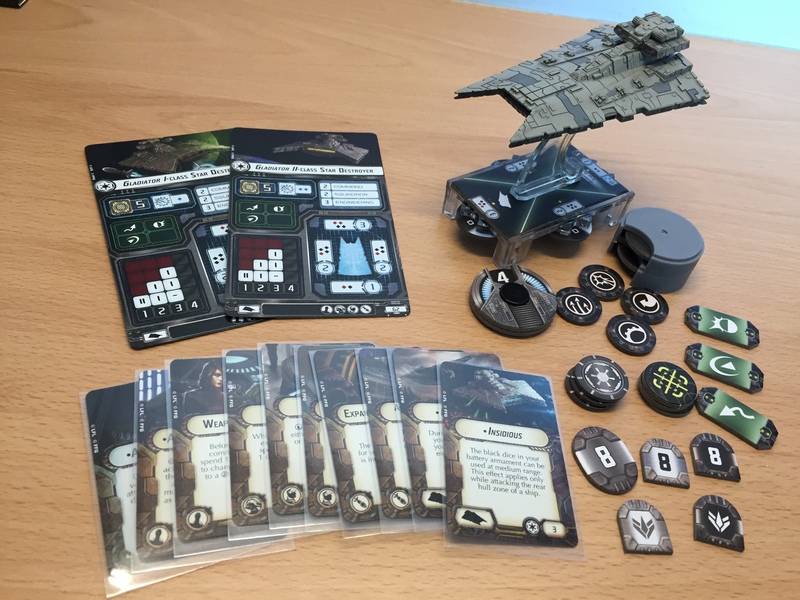 The First thing to say about the Star Wars Armada Gladiator Class Star Destroyer Expansion Pack is how much stuff comes with it! 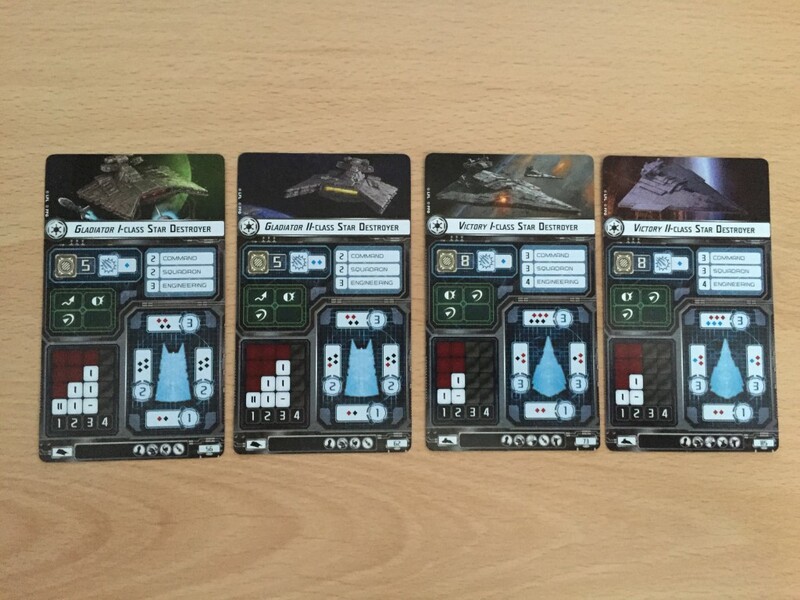 It’s a medium sized ship, that comes with a plethora of tokens and upgrade cards. 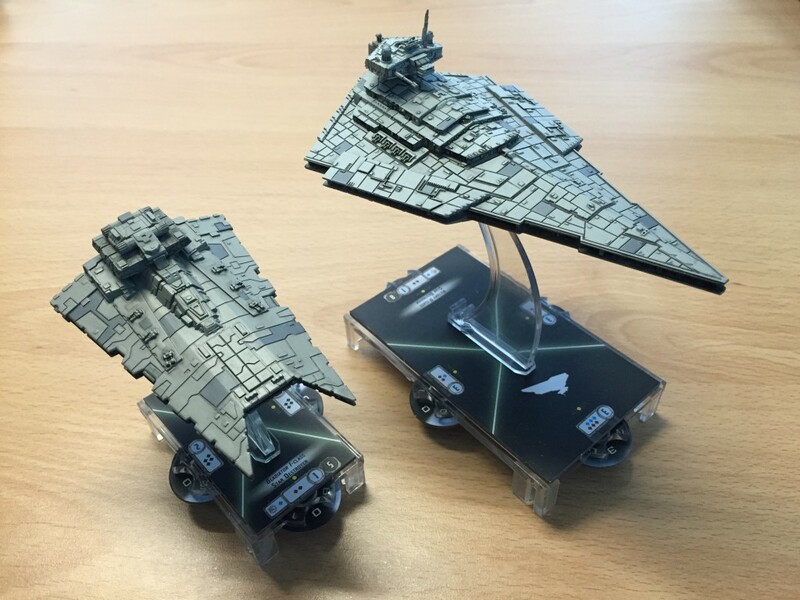 There’s two version of the ship (both with red & black dice) so this is a short range ship, as opposed to the Victory class which also has two options, one being short range and one being long range. To compare it to the victory, it’s about half the size, it’s still a pretty meaty looking ship, but in comparison to the Victory class, it’s definitely the baby of the family! The painting on the figure is pretty tidy too, which is nice! 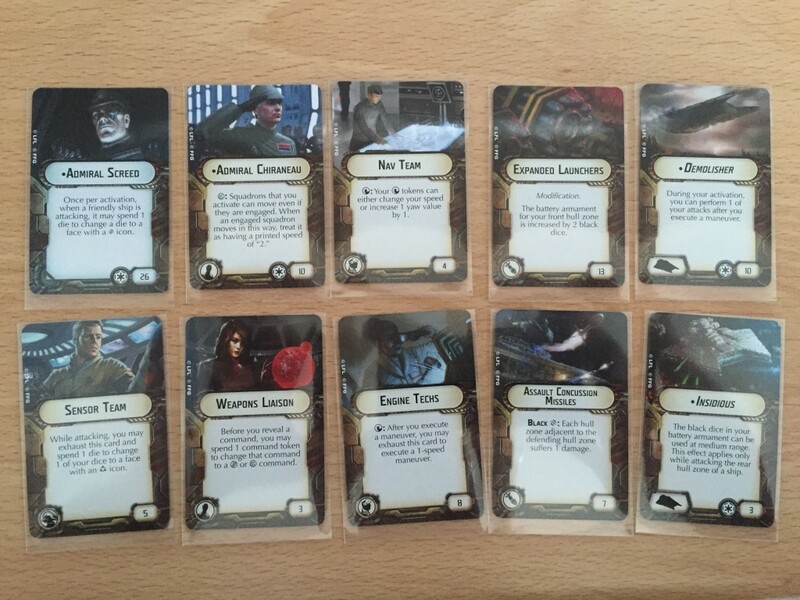 Here I’ve got the victory class cards next to the Gladiator for a bit of comparison. Even with a smaller ship, this still has three shields on the front which is pretty good, and two on each side. Both varients of the Gladiator use black dice, but lots of them. That means it’s a short range craft, but a really hard hitter. Where one of them also uses some red dice, so you can still knock some shots out at long range, but really you want to get in close with this ship. It also has the ability to do so, having a top speed of 3, where the victory only has a top speed of 2. At lower speeds its also highly maneuverable, look at the two clicks on speed 1! Against fighters the Gladiator II has the edge over all these other cards with an extra blue die. That’s going to give out some serious firepower against fighters. One thing I do find interesting is the inclusion of an evade counter on the Gladiator, which is totally in effective at close range, but that’s where it’s looking to get to, with the short range black weapons. Possibly to try and protect it until it gets there? I’m not sure. Maybe after a couple of games I’ll have worked this out. Both the victory and the Gladiator have some ability to upgrade quite a bit, with 4 different upgrade slots on gladiator expect to see a lot of cards attached to each ship! This is the upgrade cards that come in the pack, 10 cards, with a couple of faction specifics and a couple just for the Gladiator. Insidious makes black dice effective at medium range as long as you’re targeting the rear of a ship, which can be quite nasty! 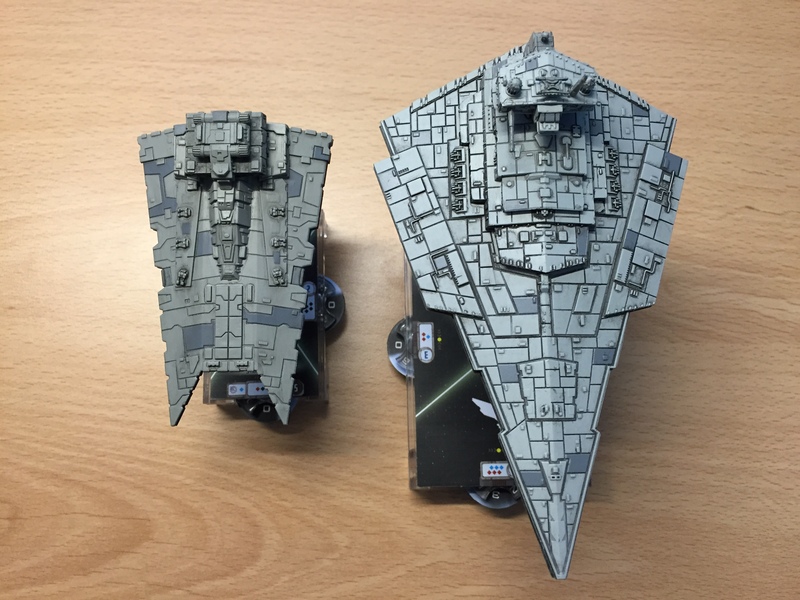 Thanks for reading my post about the Star Wars Armada Gladiator Class Star Destroyer Expansion Pack, I’ll post some other unboxing type posts as I get them.